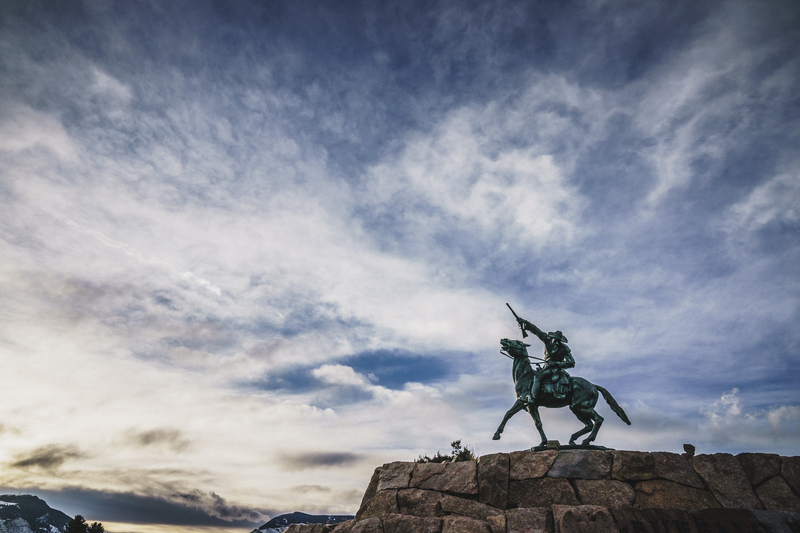 Buffalo Bill – The Scout Statue outside the Buffalo Bill Center of the West, Cody, Wyoming. 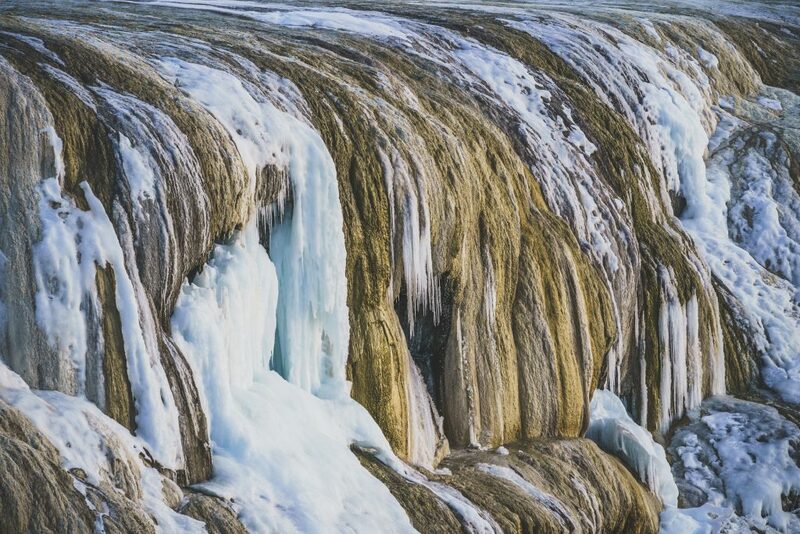 Over the winters I’ve gone to Cody, Wyoming for the ice climbing in the South Fork of the Shoshone River. Each of these trips consisted of arriving to Cody well after dark, driving up the canyon before sunrise, whacking ice all day, returning to town late, eating one pot meals off a single burner stove in a motel room, sleeping, then repeating the process until I was too tired to continue. 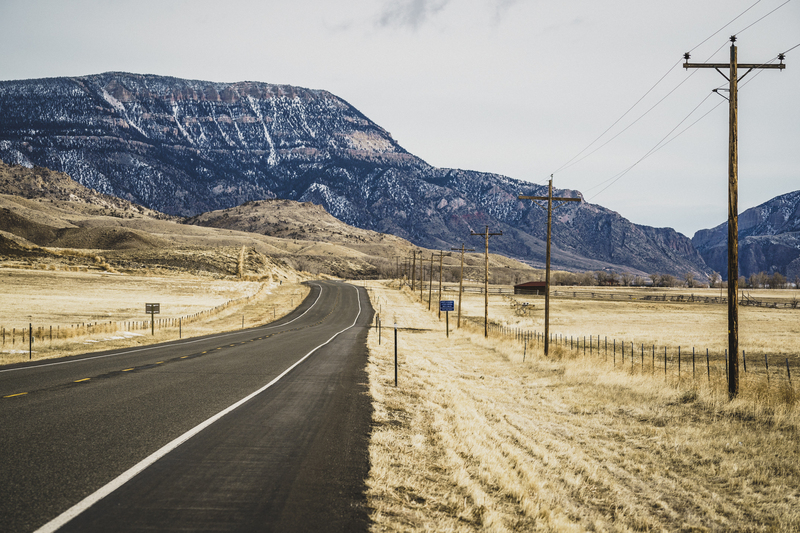 The trips always ended with a bleary-eyed drive home to Salt Lake City without ever exploring the town and its surroundings. This February I fell into an opportunity to fix all that. The North Fork of the Shoshone River, Park County, Wyoming. 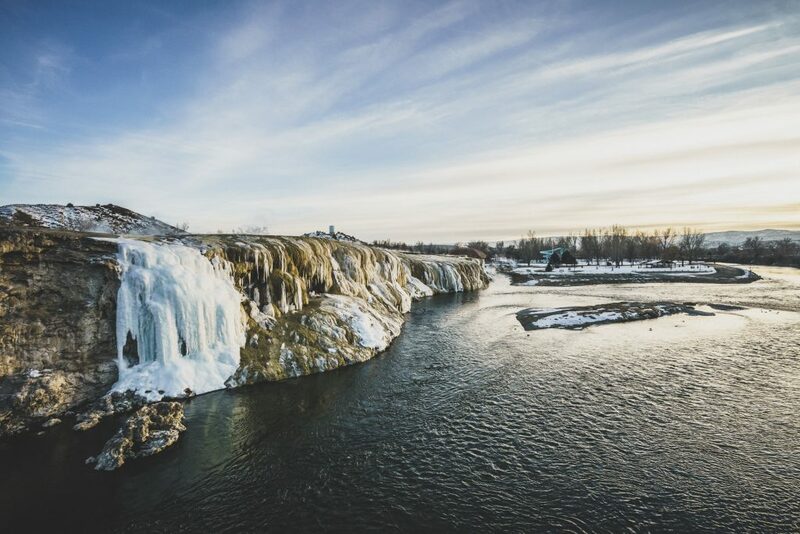 Travel Wyoming had put together a Wild West Wyoming Winter Tour through the northwest corner of the state. Two days in and around Cody and one day in Thermopolis. Through luck, persistence, and perhaps a lack of oversight from Travel Wyoming, I managed to get an invite and before they could rescind or catch their error I was on the road rolling north through the sage plains of central Wyoming. 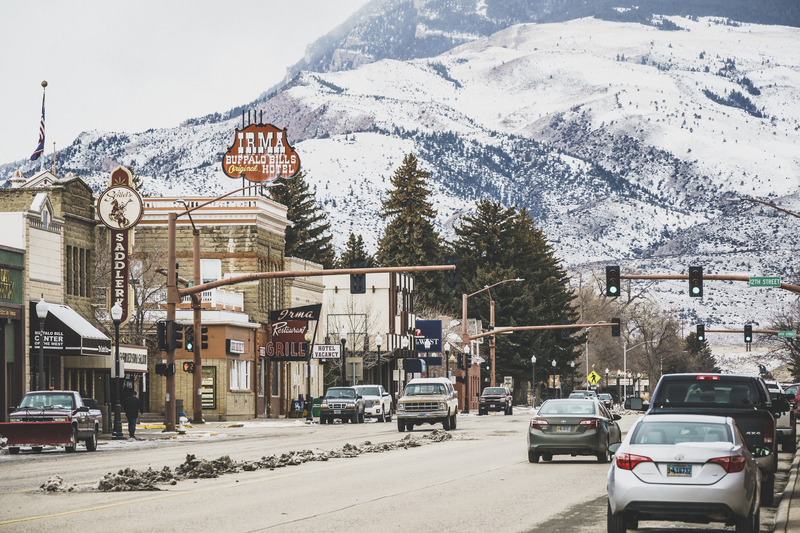 Below the eastern slopes of the Absaroka Mountains near the banks of the Shoshone River is the town of Cody. 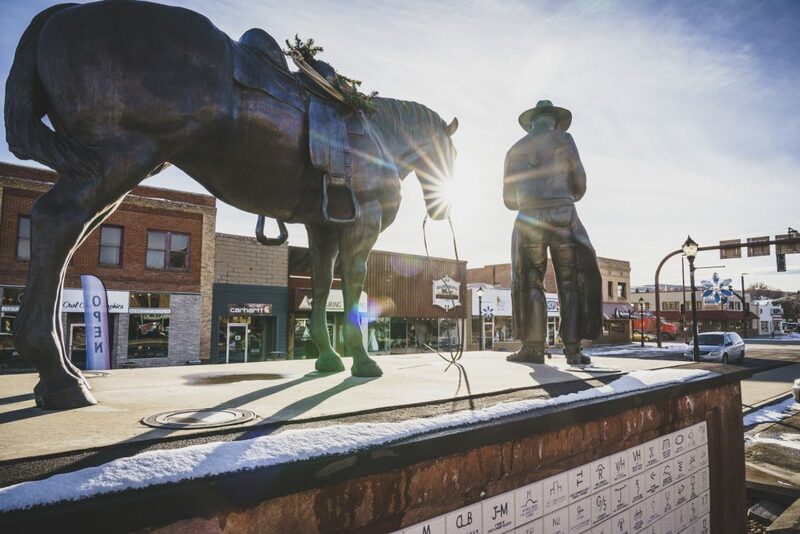 The main drag through town, Sheridan Avenue, runs east/west and is lined with western themed hotels, cafes, restaurants, bars, and shops, all tipping their hats to the area’s frontier past. 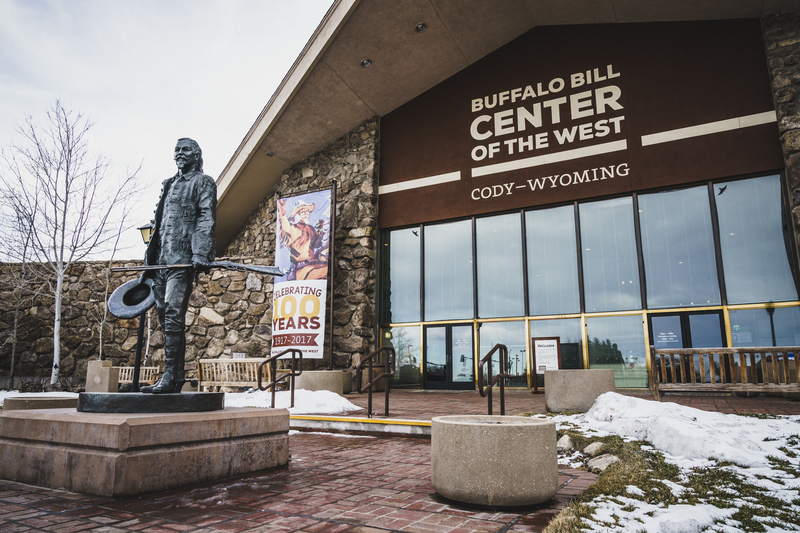 Buffalo Bill Center of the West, Cody, Wyoming. 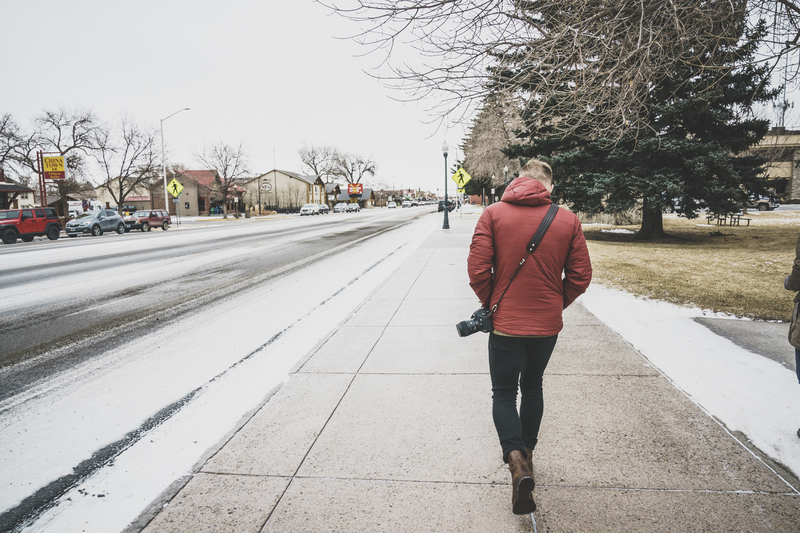 The tour began by meeting the rest of the crew of Brandon Eckroth, Courtney Steeves, Jenna Spesard, and Tia Troy at the Yellowstone Regional Airport then heading down Sheridan Ave to the Buffalo Bill Center of the West. At first glance you could easily write the center off as a tourist trap, but that would be wrong. Within its walls are five museums. And when I say five, I mean that each of them could easily be stand-alone destinations in any metropolitan area. 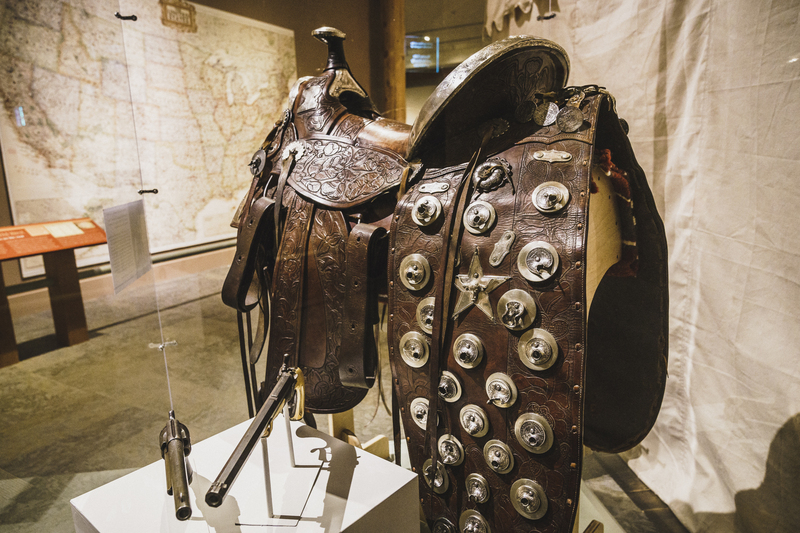 The Cody Firearms Museum houses the largest collection of American-made firearms in the world. 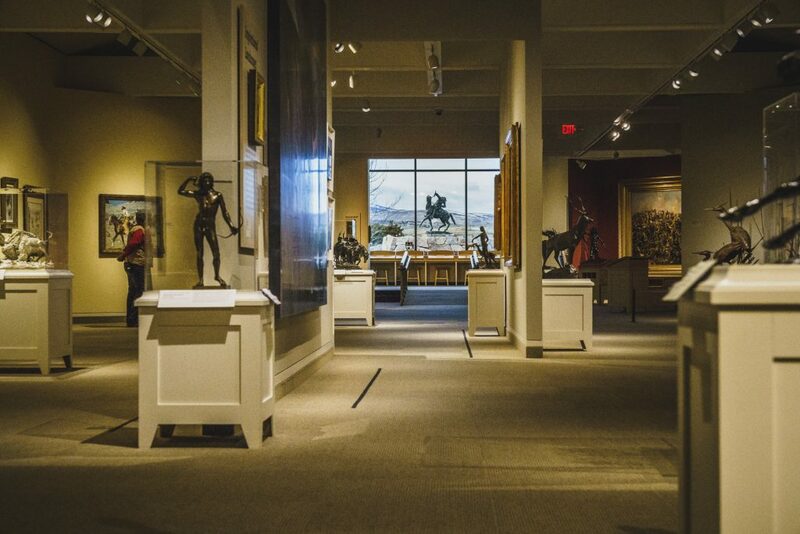 The Whitney Museum of Western Art is a fascinating look at the western United States through the eyes of numerous artists and mediums. The Plains Indian Museum is a comprehensive look into the evolving lives of the Plains Indians. The Buffalo Bill Museum is focused on the life of guide, scout, frontiersman, actor, showman, and founder of Cody who became an American icon. 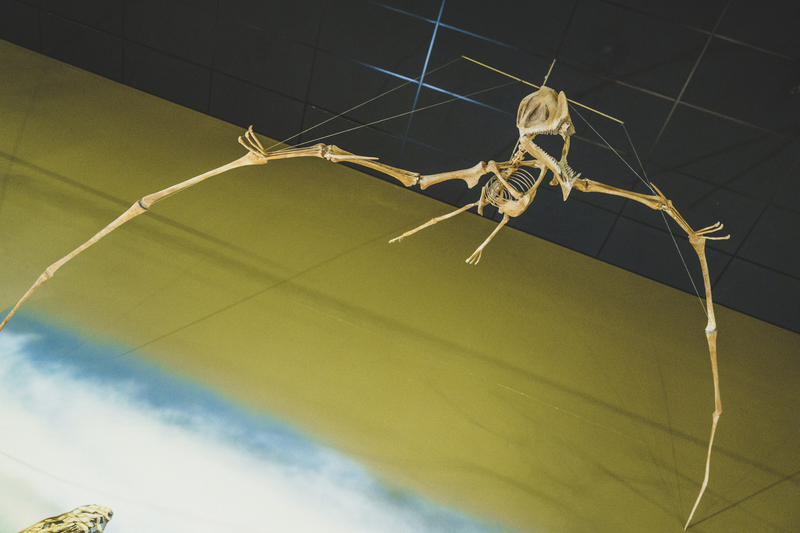 The Draper Natural History Museum is an in-depth journey that takes you deep into greater Yellowstone ecosystem. Our entire group agreed that there are so many things to see and study at the Center of the West that one visit is definitely not enough. Luckily, a pass to the center is actually good for two days. I will definitely go back. English double barrel flintlock shotgun, Cody Firearms Museum, Buffalo Bill Center of the West. The Scout Bronze Statue of Buffalo Bill Cody as seen from the Whitney Western Art Museum, Buffalo Bill Center of the West, Cody, Wyoming. 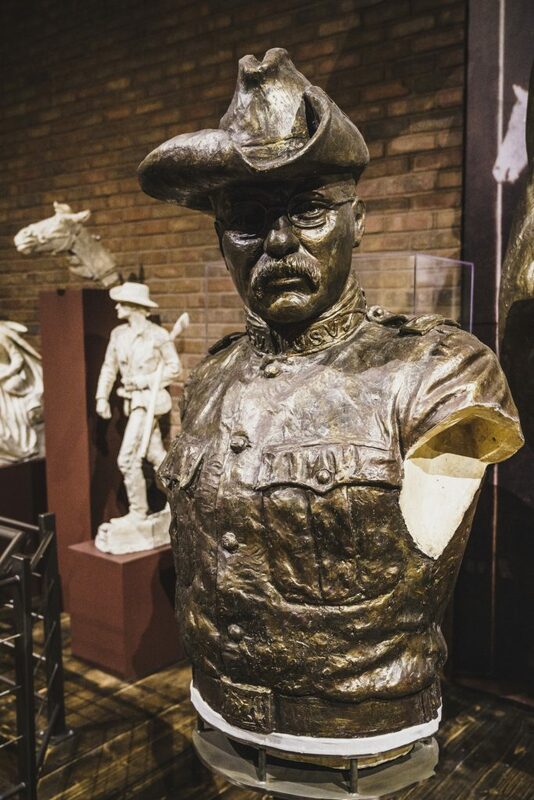 Teddy Roosevelt bust from the Rough Rider bronze, Whitney Western Art Museum, Buffalo Bill Center of the West, Cody, Wyoming. Seasons of Life gallery, The Plains Indian Museum, Buffalo Center of the West, Cody, Wyoming. 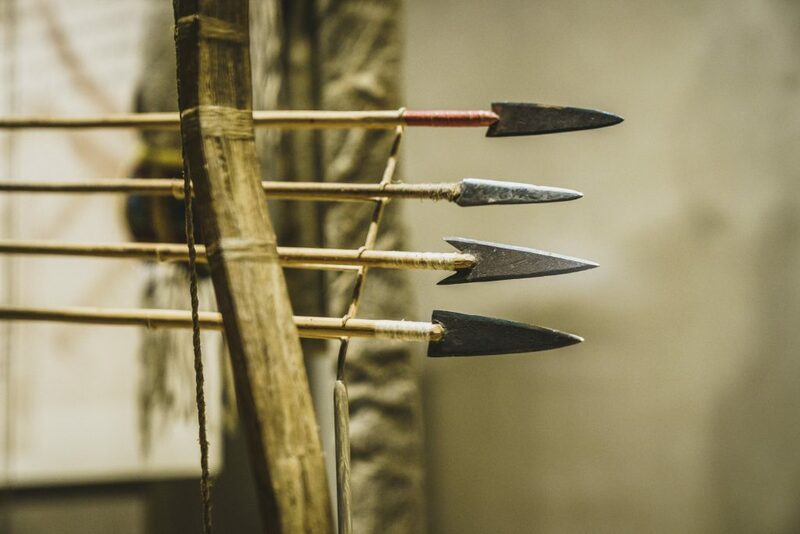 Arrow Heads, The Plains Indian Museum, Buffalo Center of the West, Cody, Wyoming. 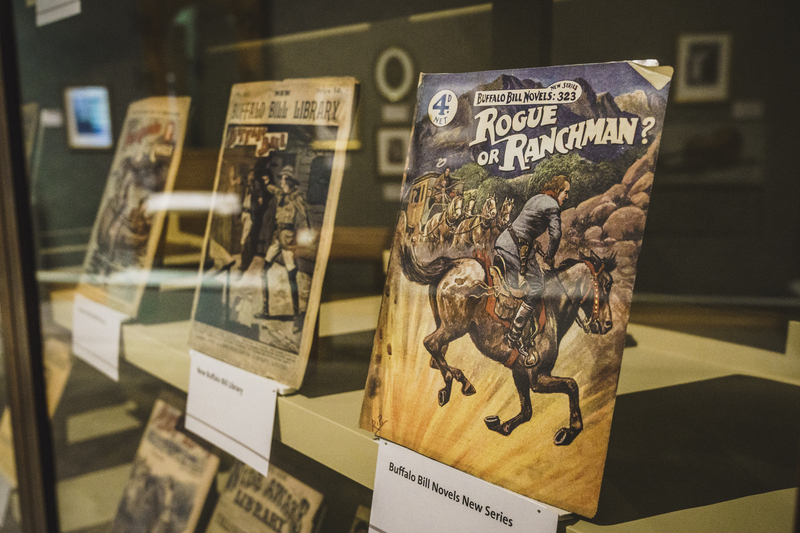 Dime Novels, Buffalo Bill Museum, Buffalo Bill Center of the West, Cody, Wyoming. A-Frame Western Saddle, Buffalo Bill Museum, Buffalo Bill Center of the West, Cody, Wyoming. 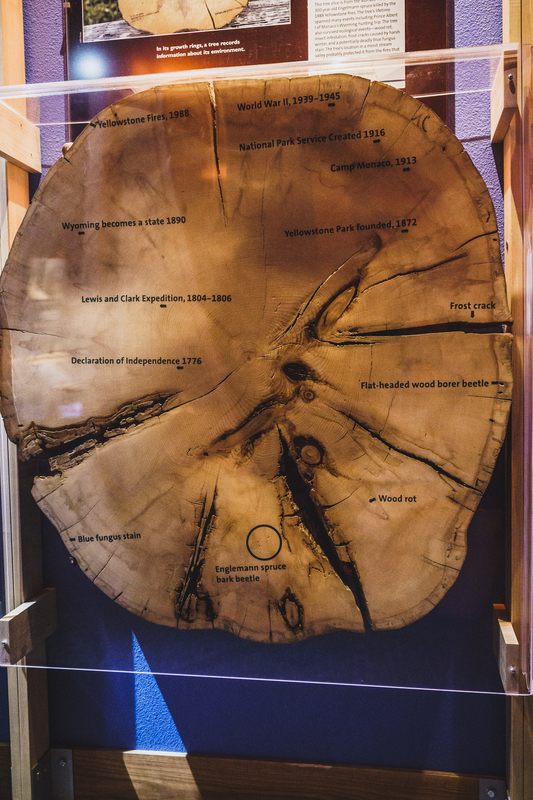 Manaco Tree Slice, Draper Natural History Museum, Buffalo Bill Center of the West, Cody, Wyoming. 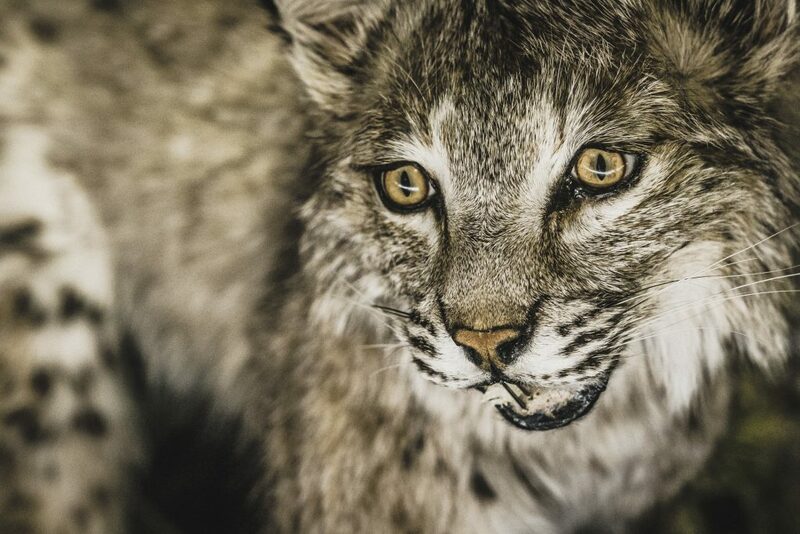 Bobcat, Draper Natural History Museum, Buffalo Bill Center of the West, Cody, Wyoming. After having my mind blown at the Center of the West we drove down the avenue to the Cody Firearm Experience. 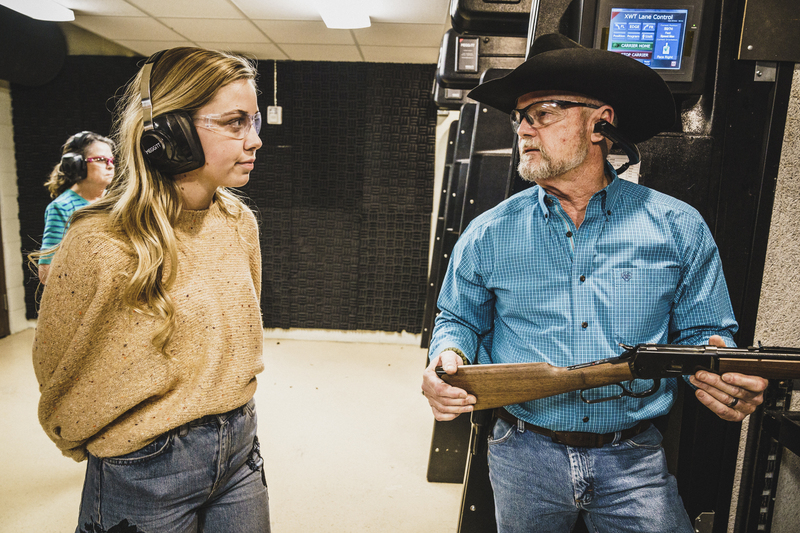 The owner Paul Brock, a former curator for the Cody Firearms Museum, had the brilliant idea of combining the history of firearms in America with a gun range, giving visitors a one-of-a-kind interactive experience. A prominent display of replica firearms at the entrance shows the history and evolution of the guns in the West. 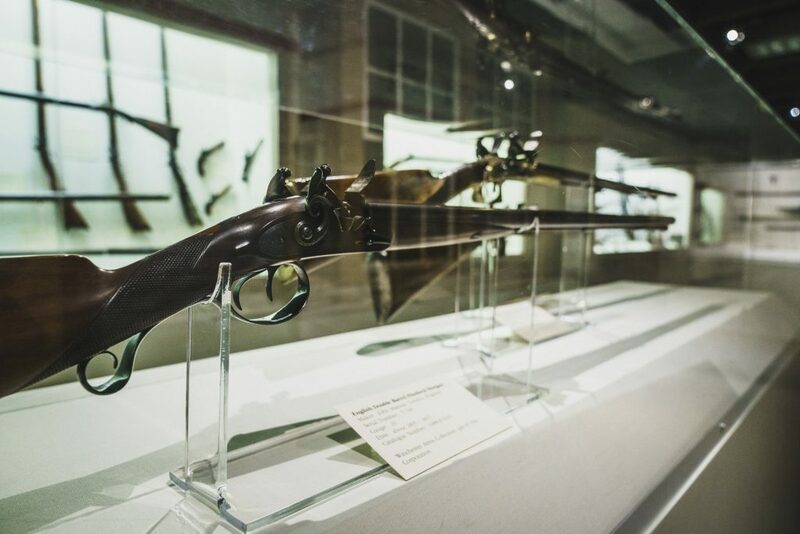 Visitors have their choice of which firearms to use, ranging from way back up to the latest makes and models. Under Paul’s supervision we were allowed to squeeze off a few rounds. Our group settled on a Colt Walker Conversion revolver (cowboy gun) and a Winchester Colt 45 Rifle. Paul offered up a Gatling gun to test out, but none of us had the nerve. Paul Brock demonstrates how to fire at the Cody Firearms Experience, Cody, Wyoming. 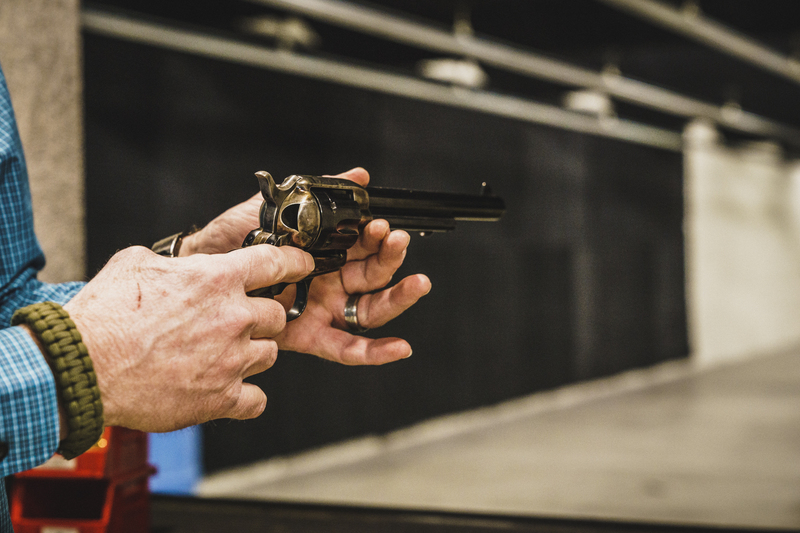 Colt 45 Revolver, Cody Firearms Experience, Cody, Wyoming. 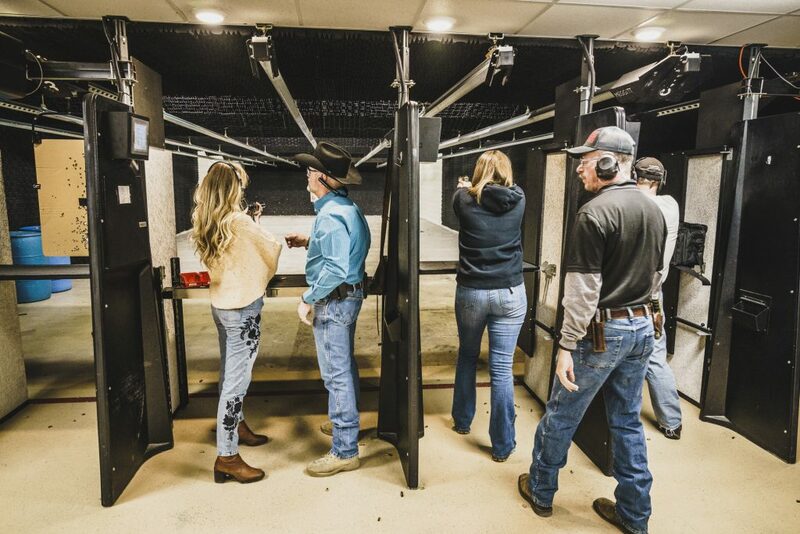 Paul Brock demonstrates to Courtney Steeves how to fire at the Cody Firearms Experience, Cody, Wyoming. 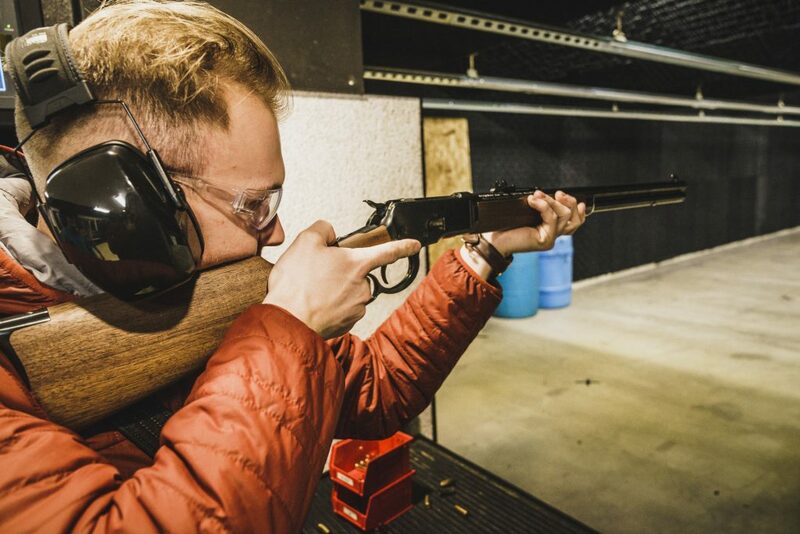 Brandon Eckrpth at the Cody Firearms Experience, Cody, Wyoming. 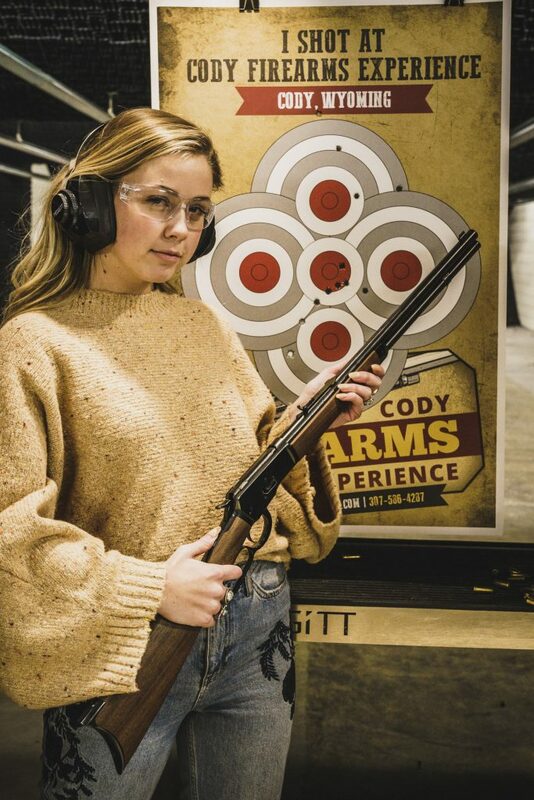 Courtney Steeves with her target at the Cody Firearms Experience, Cody, Wyoming. Day two began in the dark with a predawn drive up the North Fork Highway, not too different from my previous visits to Cody. But for this early start we were rewarded with a technicolor light show above the Shoshone River. After a quick photo snapping session, we met Terry Dolan from Gary Fales Outfitting in the tiny town of Wapiti then headed west to where they stopped plowing U.S. Highway 14. Terry would be guiding us on a snowmobile tour of Yellowstone. We suited up as he ran us through the operations of the sleds and the do’s and do nots of a winter tour in the park. Stay on the road, single file, obey the speed limit, and pull over as far as possible when we stop. 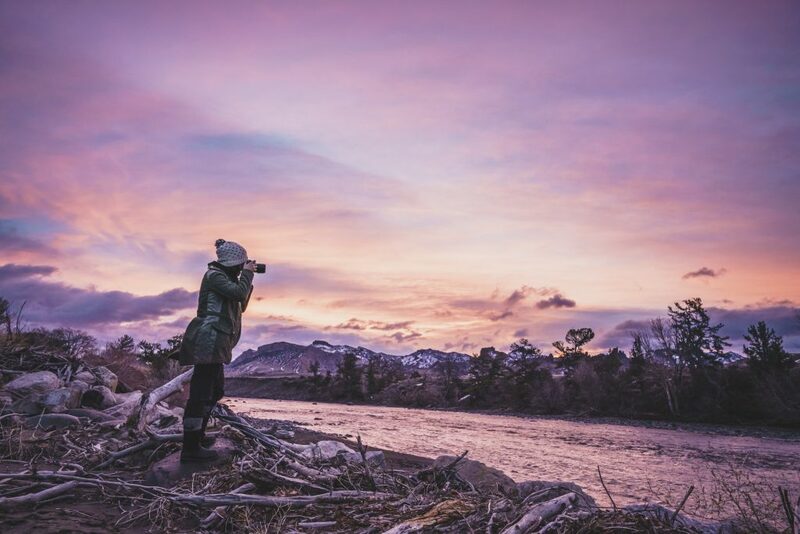 Jenna Spesard photographs the sunrise above the North Fork of the Shoshone River, Park County, Wyoming. 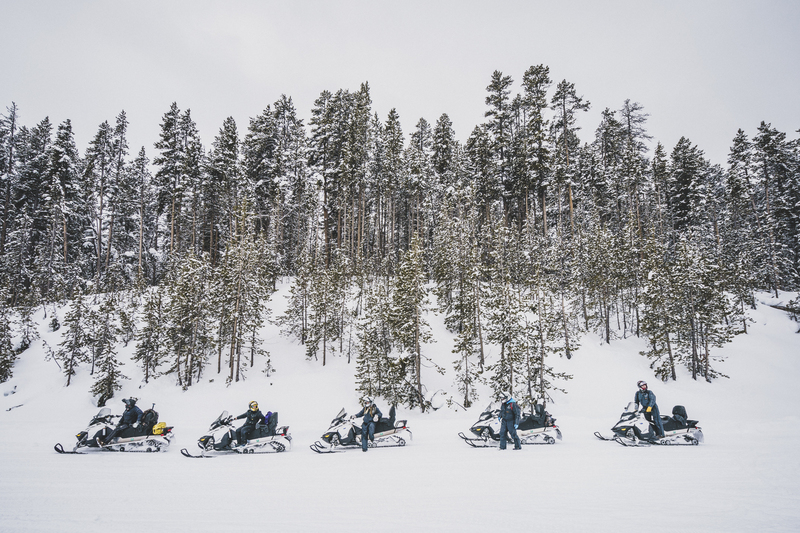 Terry Dolan, Jenna Spesard, Courtney Steeves, Tia Troy, and Brandon Eckroth out for a snowmobile tour of Yellowstone National Park, Wyoming. 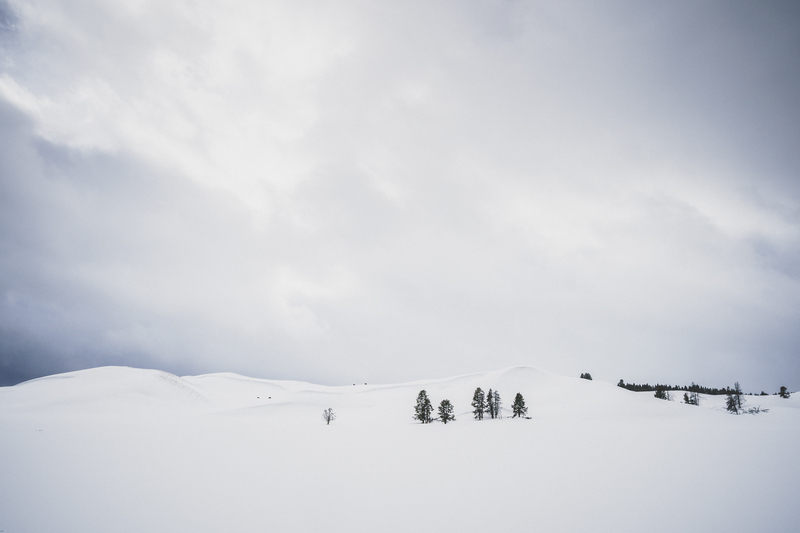 Winter landscape of Yellowstone National Park, Wyoming. Under cloudy skies we hummed into the park via the east entrance. Up to Sylvan Pass we wound our way along the snow-covered road and witnessed the scenery open up into swaths of evergreens, steep canyons, and stark ghost forests – loud reminders of wildfires from the recent past. 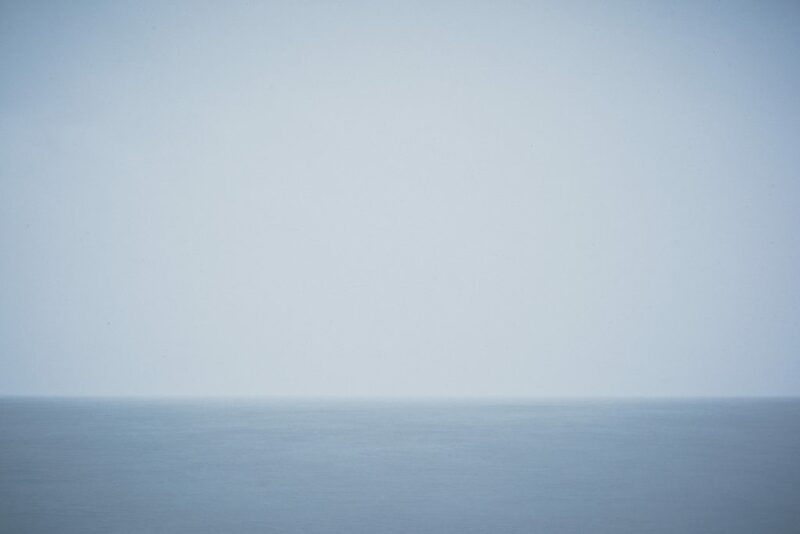 Descending to Yellowstone Lake the horizon opened to an undefinable expanse layered with subtle hues of winter. Along the way Terry pointed out land marks and wildlife. 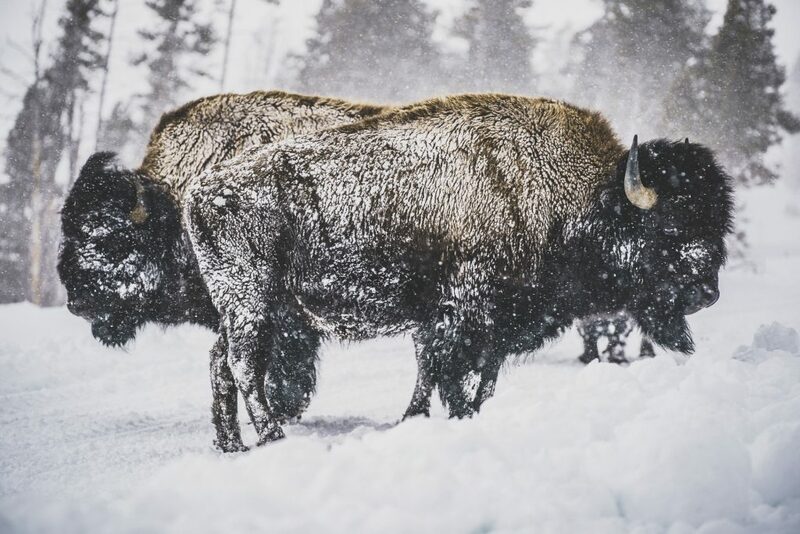 Snowy bison, a lethargic coyote, trumpeter swans, and birds of prey. We stopped to eat lunch at the Fishing Bridge Warming Hut while Ranger Miller give us an update on the winter happening in Yellowstone. After lunch we made our way to the jaw dropping views of the Grand Canyon of Yellowstone. I’ve never really considered taking a snowmobile tour of the park before this trip but having experienced the undeniable beauty of Yellowstone in winter, without the crowds, the pressure, and expectations, I have to say that it’s something I won’t forget. If you have the opportunity I highly recommend it. 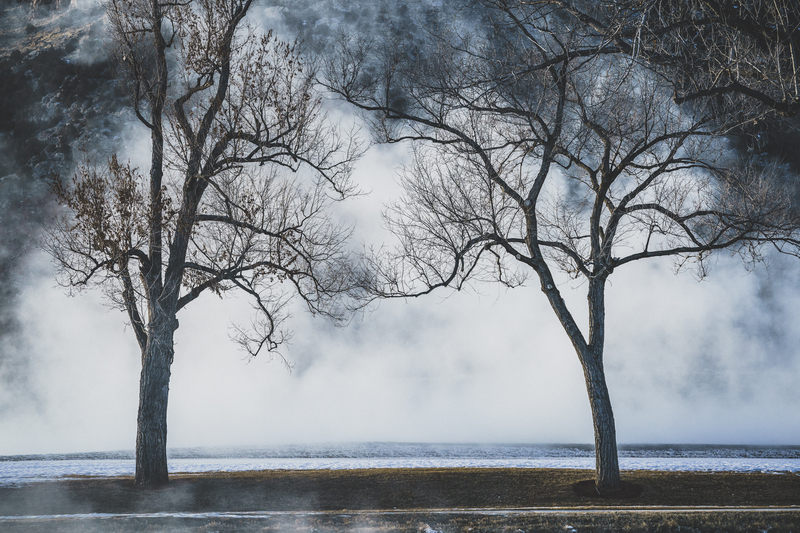 A frozen Yellowstone Lake in winter, Yellowstone National Park, Wyoming. Two-headed bison, Yellowstone National Park, Wyoming. 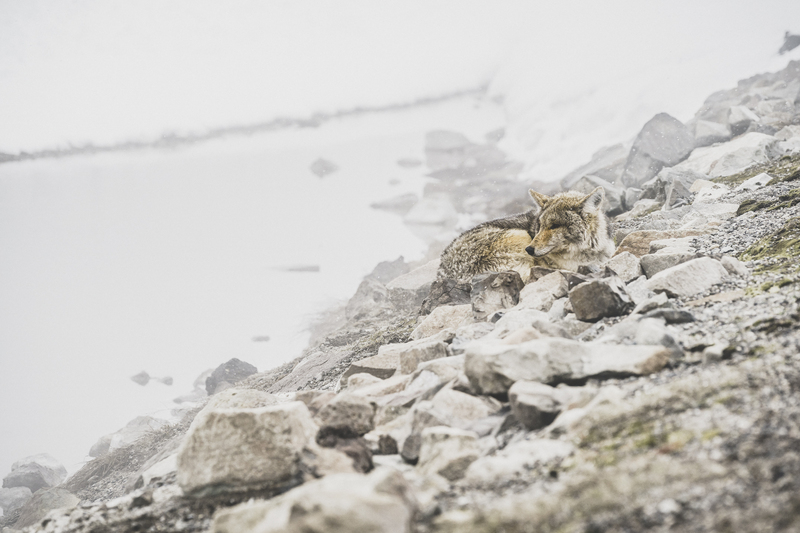 It’s mating season for coyotes in Yellowstone National Park. This fellow was seen relaxing near a thermal pond in Pelican Valley. 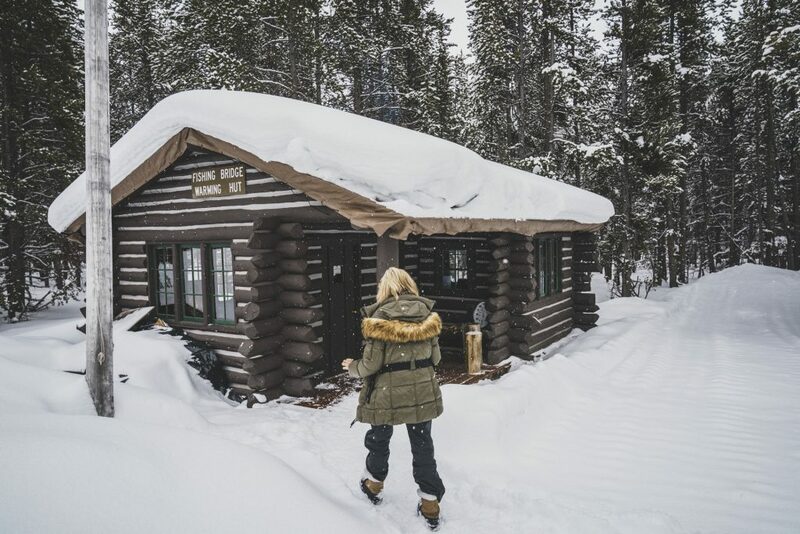 A popular lunch spot, Fishing Bridge Warming Hut, Yellowstone National Park. 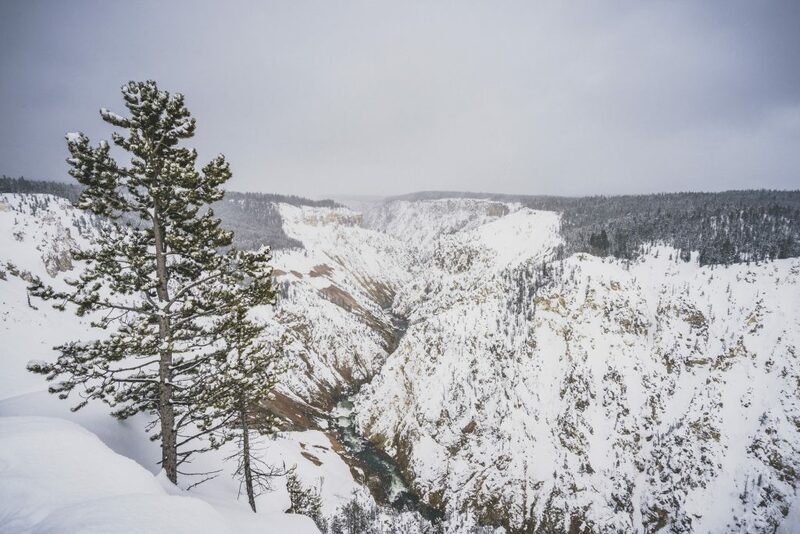 A winter view of the Grand Canyon of Yellowstone National Park, Wyoming. The temperature plummeted going into the third day of our trip making it the perfect time to head to Hot Springs County. 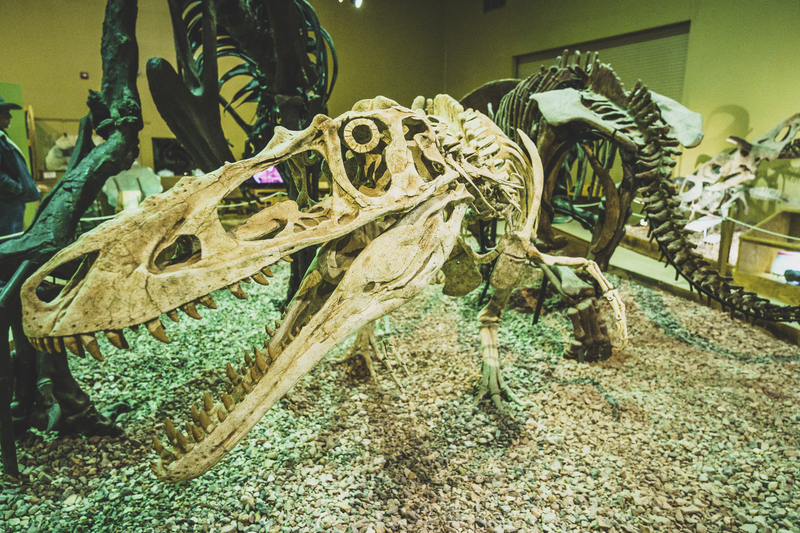 A short 85-mile drive through snowy pronghorn country landed us in the energy and tourism town of Thermopolis. 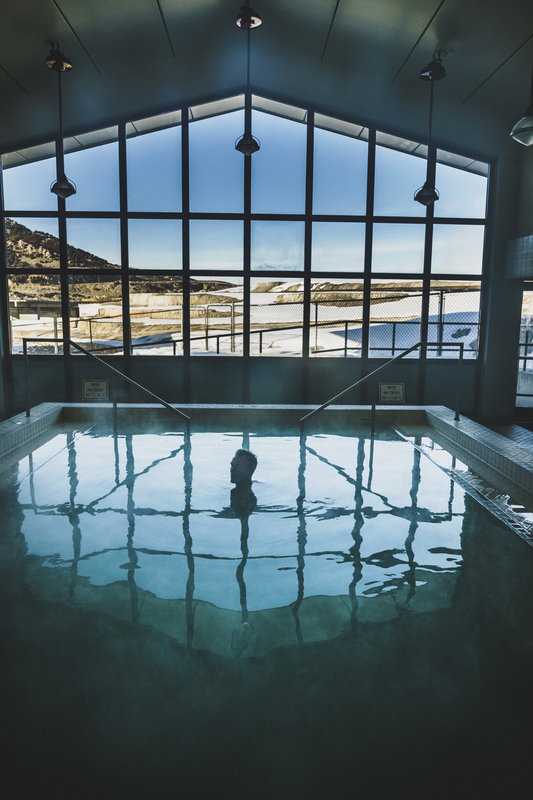 Surrounded by mountains and sitting just north of the dramatic Wind River Canyon, Themop, as the locals call it, is home to one of the world’s largest natural hot springs and dinosaurs. 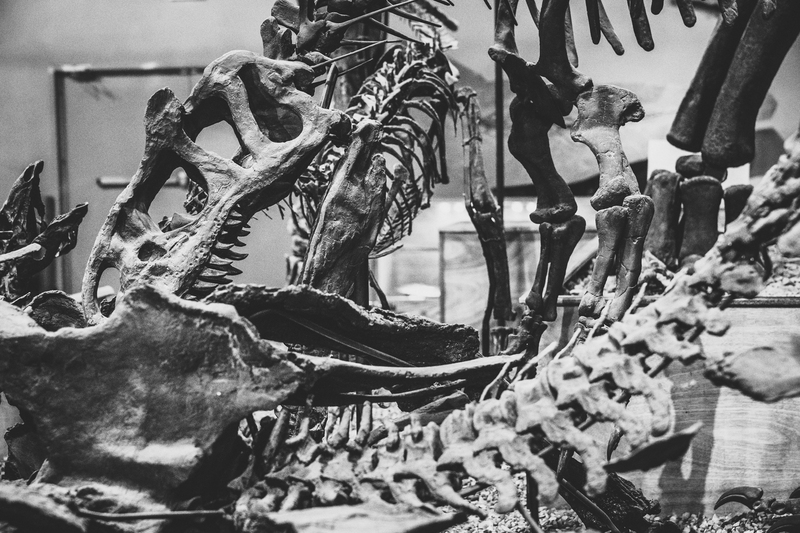 That’s right, dinosaur remains were discovered in the area in the 1990’s and soon after the Wyoming Dinosaur Center was created. 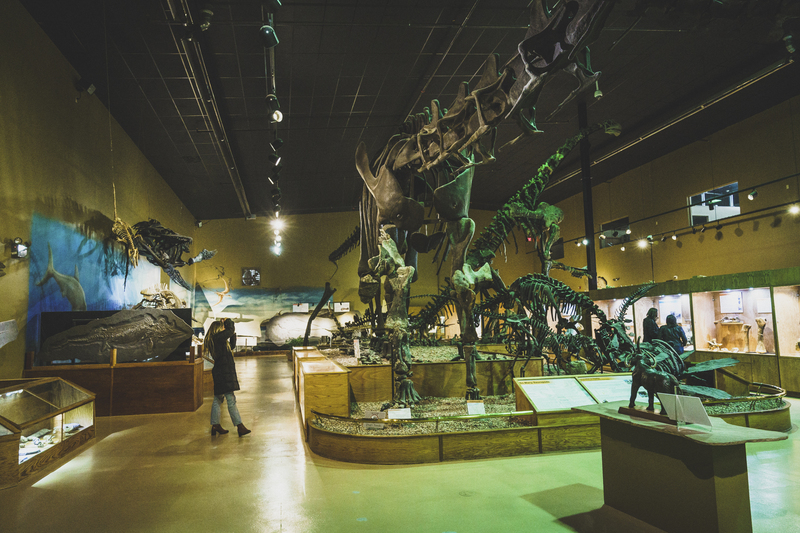 This paleontological gem is filled with life-size replicas, prehistoric skeletons, and numerous dioramas, a visit to the center is an awesome look back to a land before time and makes for a perfect pre-hot springs outing. 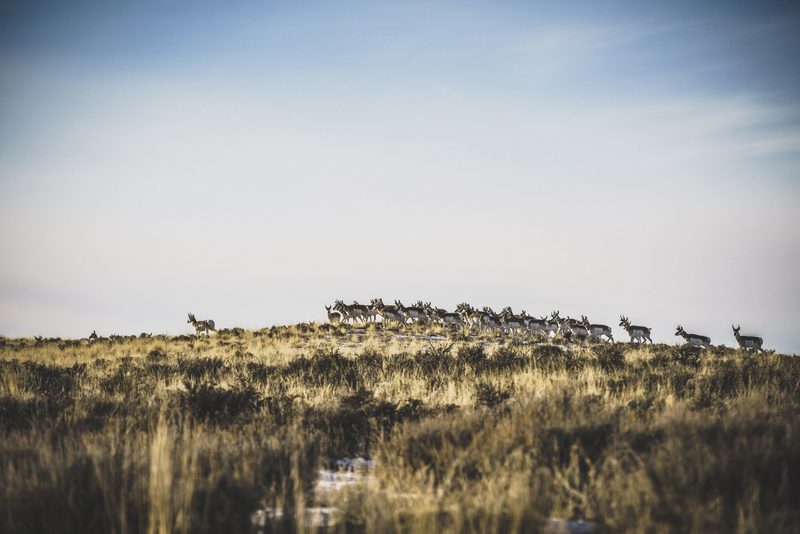 A herd of pronghorn in the sage plains between Thermopolis and Meeteetse, Wyoming. 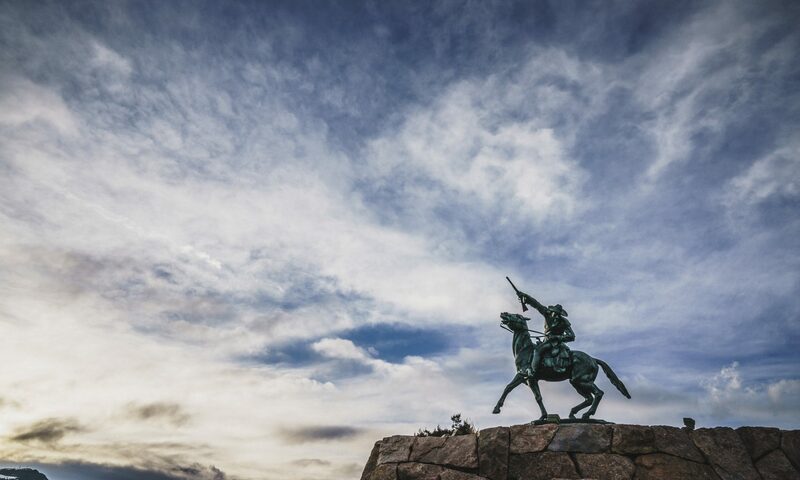 Bronze cowboy and horse in downtown Thermopolis, Wyoming. Wyoming Dinosaur Center, Thermopolis, Wyoming. Water from the Big Horn Spring flows over beautiful mineral colored terraces into the river at the north end of Thermopolis. 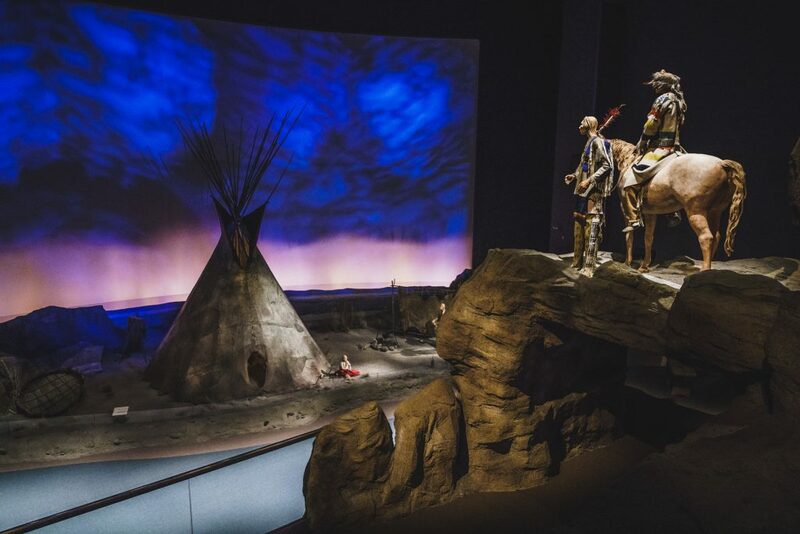 This spring, which has been used by native Americans for millennia, was sold to the government from the Shoshone and Arapahoe tribes through a treaty in 1896 with the condition they remain free to the public. Hot Springs State Park with it trails, swinging bridge, flower gardens, boat launches, bison herd, parks, picnic areas, and free public bathhouse is the result. The terraces flowing into the Bighorn River, Hot Springs State Park, Thermopolis, Wyoming. Full disclosure; I’ve been to Thermopolis several times during summer climbing and camping trips to Ten Sleep Canyon. At only sixty miles away the free bathhouse offered a great rest day recovery activity with the added bonus of a free shower! But, soaking in the public bathhouse’s outdoor pool in the middle of winter, with a water temperature near 104 degrees and an air temperature in the teens, was more refreshing than can be described. Doing it alone on Super Bowl Sunday, when everyone had gone home to watch the game, was more priceless than the admission. After having a good long soak, I opted for a quiet walk in the park while the rest of the crew headed into the Wind River Canyon. Watching the steam rise over Smoking Water Park is as amazing as the ice formations that cling to the mineral terraces. Making my way across the swinging bridge, over the Big Horn River I was given a fabulous vantage point of the entire park. Trees at the Smoking Water Park, Hot Springs State Park, Thermopolis, Wyoming. 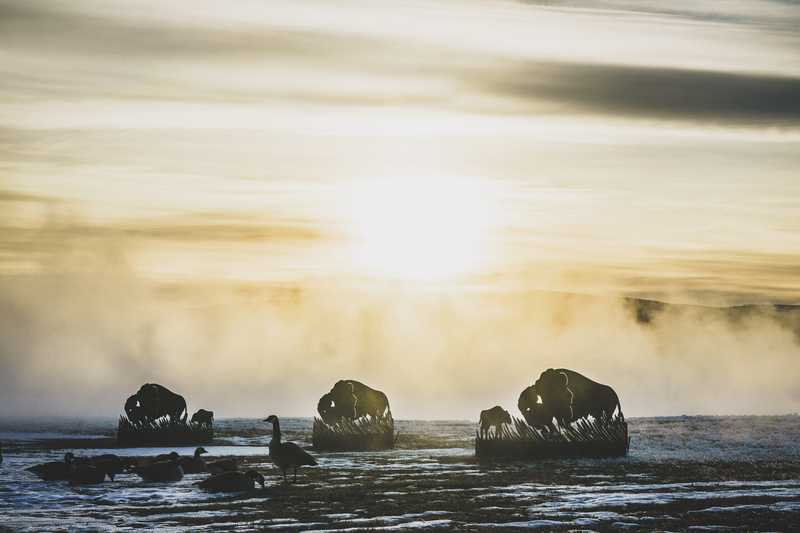 Bison silhouettes at the Smoking Water Park, Hot Springs State Park, Thermopolis, Wyoming. The final morning of our trip was spent with Barb and Merlin Heinze at their place in Thermopolis. 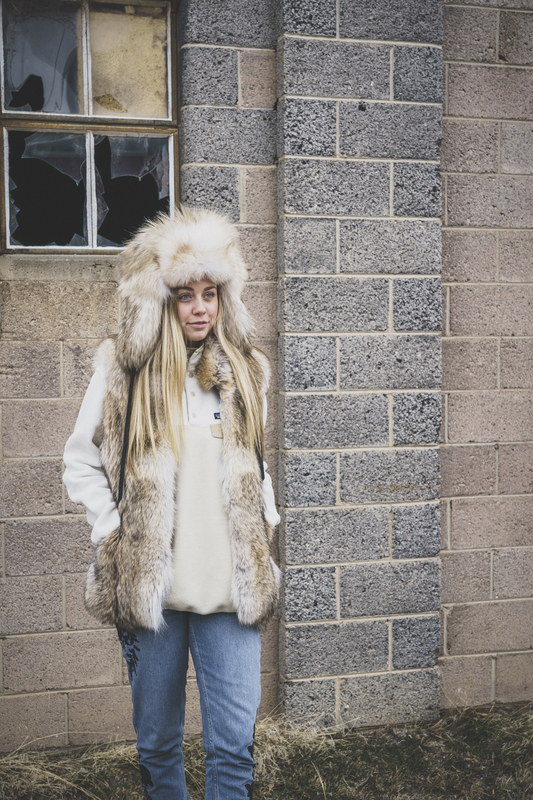 The visit was an incredible look inside the handcrafted fur and leather clothing trade. Merlin’s Hideout is a tannery, sewing studio, and custom clothing retail shop with a reputation for buffalo fur coats. Quick trivia: Merlin made eight buffalo coats for Kurt Russell’s character in the Quentin Tarantino movie “The Hateful Eight”. 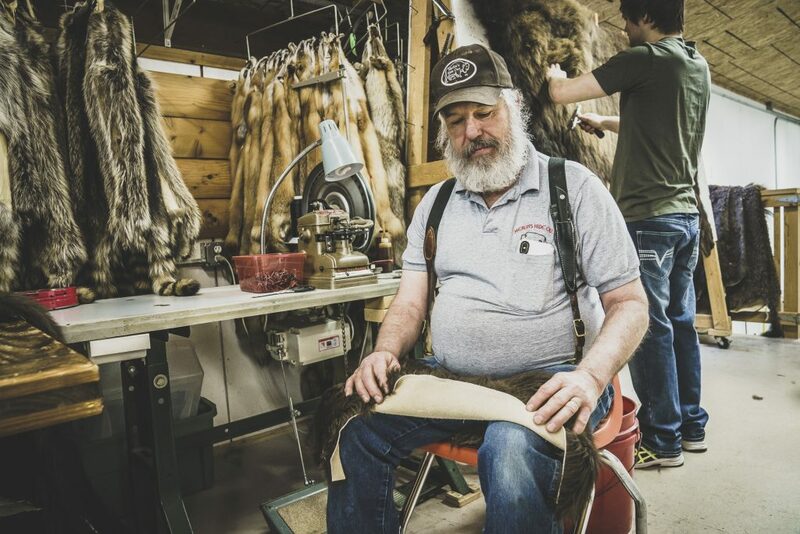 Stopping in and being shown around opened my eyes to a world I knew very little about and hearing Merlin’s story of making a pair of beaver gaiters for himself that quickly led to making a whole line of fur products for others was incredible. We concluded the visit with trying on a few of their jackets, being blown away by their warmth and comfort, and then promptly being turned down when asked if they would be willing to trade one for my nappy jacket. 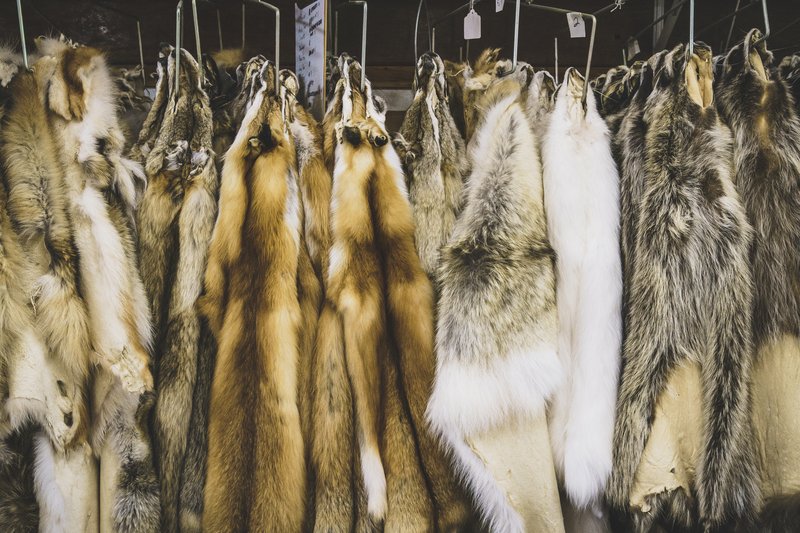 Fox pelts at Merlin’s Hideout, Thermopolis, Wyoming. Merlin Heinze at the sewing machine, Merlin’s Hideout, Thermopolis, Wyoming. 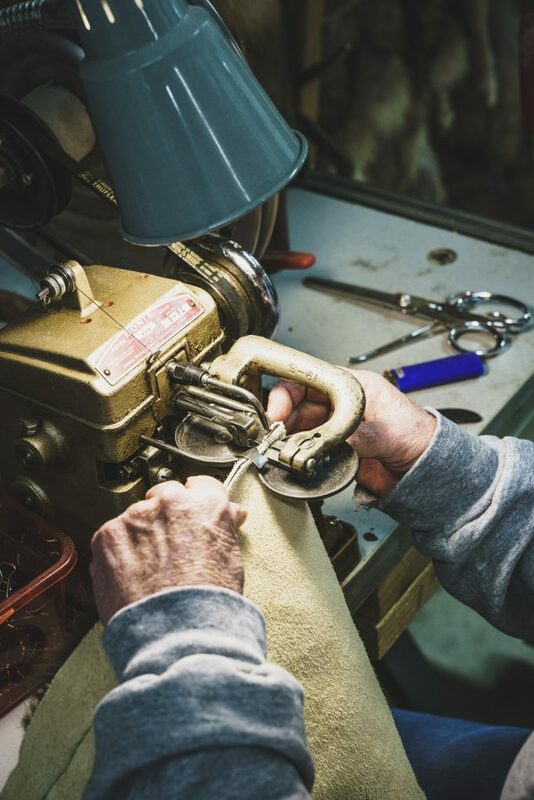 The sewing process at Merlin’s Hideout, Thermopolis, Wyoming. Courtney Steeves with a coyote vest and hat, Merlin’s Hideout, Thermopolis, Wyoming. 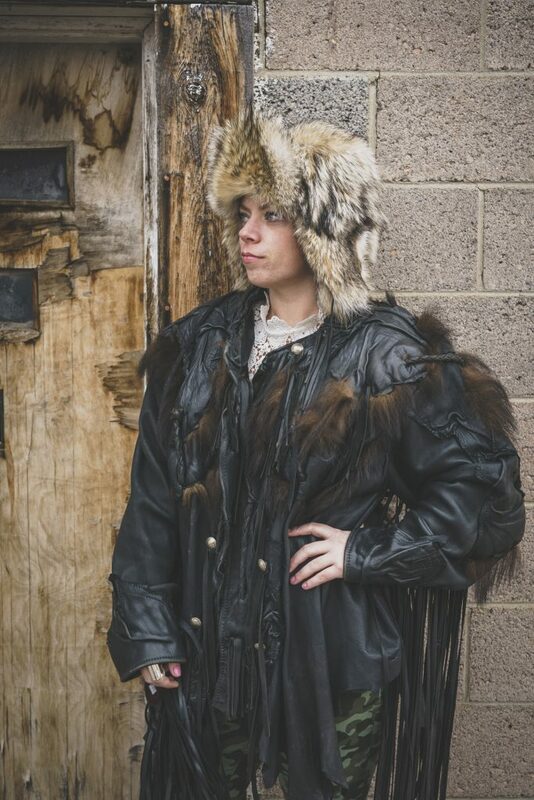 Tia Troy with a suede jacket and coyote hat, Merlin’s Hideout, Thermopolis, Wyoming. 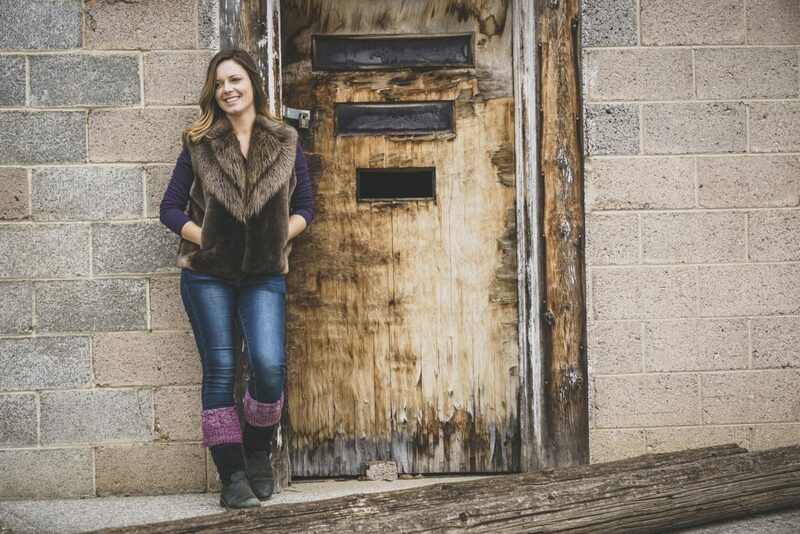 Jenna Spesard with a beaver vest, Merlin’s Hideout, Thermopolis, Wyoming. 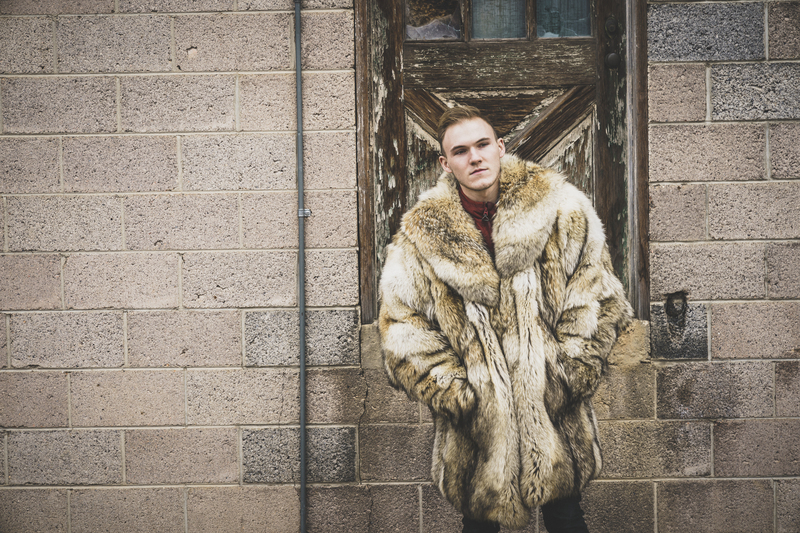 Brandon Eckroth models a coyote fur coat, Merlin’s Hideout, Thermopolis, Wyoming. And just like that the trip was ending. Back in Cody after loading up the car and waving good bye I asked myself “why”. Why come to the northwest corner of Wyoming in the dead of winter? By default I’d be coming back for the ice climbing, but would I return for the history of the Wild West, Yellowstone, paleontology, or the hot springs? 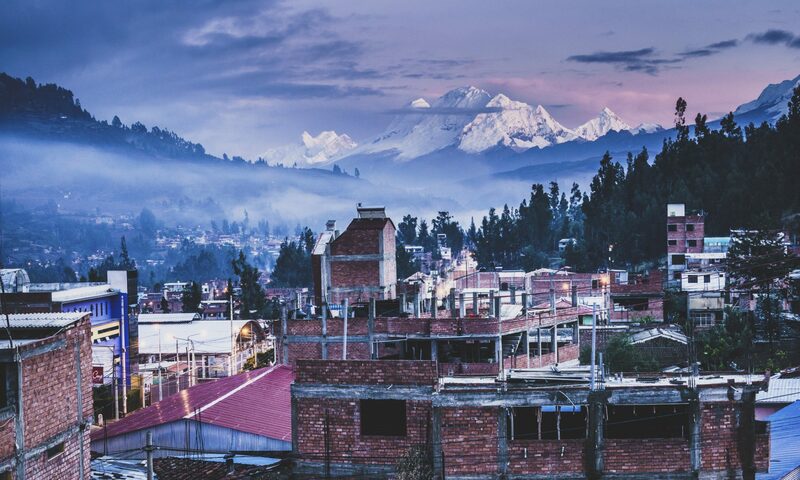 Or might I come again to meet and be inspired by folks living their very own American dream? 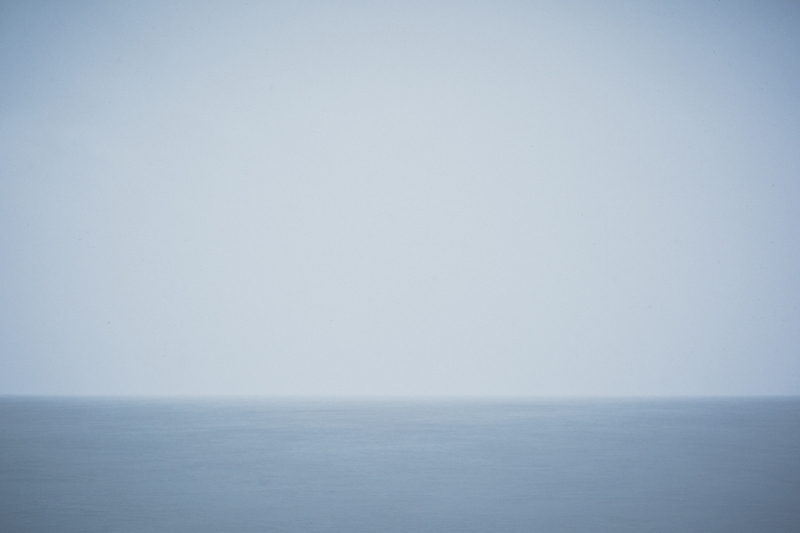 While these thoughts ran through my head I recalled a quiet moment from the first day of the trip. Brandon Eckroth walking Sheridan Avenue, Cody, Wyoming. Before meeting the rest of the crew, I’d walked east along Sheridan Avenue leaving the shops and restaurants behind. At the top of a short hill I looked west over town to the Absaroka Mountains then turned my gaze north to Heart Mountain. Soaking up the scene I was startled by a prairie falcon sitting on a fence post not 20 feet from where I stood. At first the bird gazed at me with one eye then rotated its head and looked at me with the other. It repeated this a few times shaking its head before taking flight. 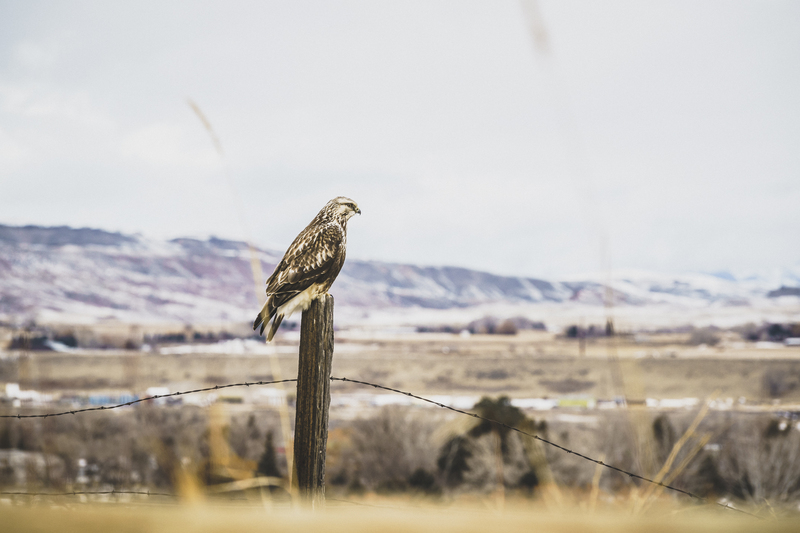 Prairie falcon on a post, Cody, Wyoming. I’ll definitely be coming back to Cody and Thermopolis for the climbing and so much more. And next time it’ll be for a lot longer.